Last week’s DCW giveaway has ended. 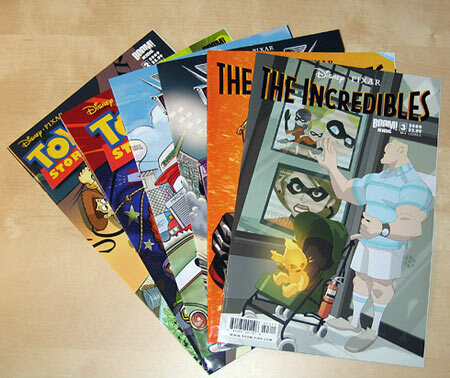 I used random.org to pick a random number and the winner of the six comics of The Incredibles, Toy Story and Cars by Boom! Studios is â€¦ (drum roll) â€¦ Alan Huestis with comment #103. There were a total of 152 entries, but 7 of these had not read the instructions correctly and did not comment with their favorite Disney comics characters, so I did not include those 7 in the drawing. Sorry guys. Alan, congratulations! I will will be contacting you shortly so that I can send you the comics. It was fun to do this giveaway and I’ll definitely do more of these in the future. Follow this blog via RSS Feed, email or Twitter to find out about future giveaways. I have a few Boom! comics to give away. This is my first giveaway here on the Disney Comics Worldwide Blog and if this goes well I’ll do more of these in the future. Six new and unread comics from Boom! Studios: Toy Story 1 and 2, Cars 1 and 2 and The Incredibles 1 and 3. They are all new and unread. These are some of the first comics from Boom! Studios since the publisher landed the Disney license here in the United States. All you have to do to enter in this giveaway is to leave a comment on this blog post with your favorite Disney comic character by the end of Sunday August 2nd. Anyone can participate but please leave only one comment per person. Remember to enter your email address correctly so that I can contact you if you win. After August 2nd I’ll pick a random comment using the random number generator on random.org.